Today, I have a guest post from Richard, he is a British personal finance blogger passionate about saving money. He has spent the last few weeks preparing a practical guide to reducing food waste. You can follow him at Frugality Magazine. Let me know if you would love to guest post on Savvy Scot! You’re a busy person. You have a career, a home to look after, and family and friends to socialize with. At the same time you know that launching some kind of “side hustle” is a smart idea. Side hustles provide the opportunity to increase your income. Just as importantly side hustles provide a degree of insurance if you ever lose your job, and for some people they can even grow into a full time business. But who has the time for such things? This was a question I asked myself last year as I found myself getting ever more frustrated at the demands on my time, and the lack of focus I was putting into my own side hustle ideas. At the time, weeks could go by without having the time – or energy – to get on my computer and get hustling for a brighter financial future. I decided the solution was to make time. 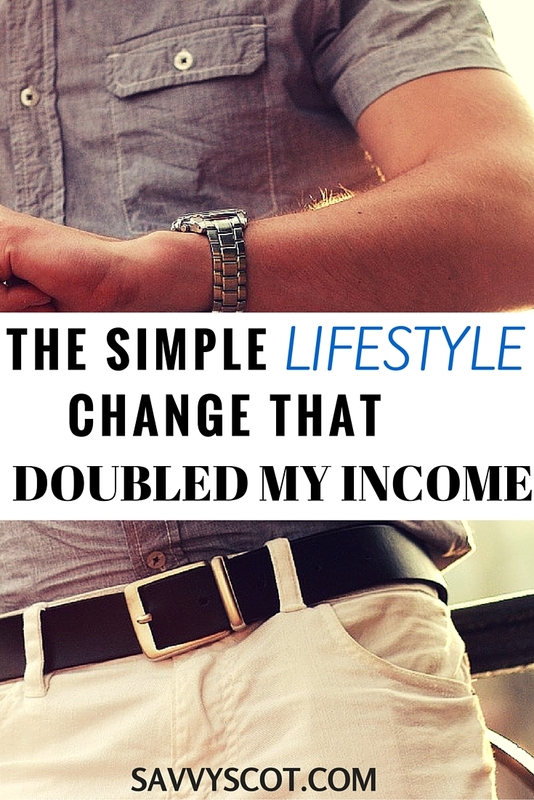 Now, I know this is easier said than done, but since I have implemented this lifestyle change I have been far more productive in my work, I feel calmer because I’m investing reasonable time each week and my income has grown considerably. In short – it works. Today I’d like to tell you in a little more detail exactly what I did, and how, in order to make this idea a reality. Very few of us have time during the day to launch a side hustle. In reality you’re going to have to build your side hustle either in the morning before work, or late in the evening when everyone else has gone to bed. Quite which situation is right for you really depends on your unique traits. I would suggest blocking off time when you’re at your most energetic and creative. For night owls this will be late in the evening. For me, as a lark, its first thing in the morning. If I get working at 7am I can achieve more in the first few hours of the day than I can in twice that time later on. The routine I applied is simple to understand – but not necessarily easy to implement. Quite simply I started getting up an hour earlier each day. Every morning I rise at 6am. I get up and drive into work, arriving about 7.15am. Normally the rest of my team start turning up around 8.30 so that gives me just over an hour every single morning to invest in my side hustle. In practise I am clocking up roughly 6-7 hours during the workweek when I’m at my most productive – plus a few hours at weekends too. The end result is that I’m getting more done than ever before – and as a result my income is increasing in line. Getting up before you need to isn’t easy – even for me. When the alarm first started going off I’d lie there in the darkness, listening to the winter weather howling outside. Staying in my nice warm bed definitely sounded like the more tempting idea. The trick I found was that the more I got up early, the better I got at it. Somehow the body adjusts. These days I literally bound out of bed first thing in the morning. I’m full of energy and inspiration and can’t wait to get that computer on! So if you’re looking to achieve a similar routine its only fair that I warn you it can be uncomfortable initially. It can take monumental amounts of self-discipline to drag yourself out of that comfortable bed. But the message here is also that it gets easier and easier. Now my body is so used to it that I wake around 5.30-6am every morning even without an alarm clock. Sometimes I’m even in the office before 7am making things happen. What’s even more motivating is that as you invest this time on a regular basis you start seeing results. You watch that website traffic increase. That guest post gets accepted. You watch your sales climbing. This, then, makes it even easier to get up because you want to see how you’re doing. It’s positively exciting to watch your side hustle progressing in direct relation to the effort you put in. And as those results keep climbing, so will your motivation to keep on doing it! In other words if you’re serious about becoming an early riser you just need to “man up” and put the initial effort in. Over time its gets both easier and more enjoyable. Its just those first few weeks or months that are tough as your body clock adjusts to your new lifestyle. OK, so you’re getting up nice and early now. You’re ready for business. But what do I actually do with this time? The first step to success is creating a plan. You need to be efficient with your time, so spending time bumbling around trying to decide what to do is far from effective. Instead I make a plan of what I want to achieve each week, and I then divide this into days. That way, as soon as I sit down at my computer I’m ready for action. I keep my own list on my cell phone so I can consult it at any time, add on tasks or monitor my progress. The plan is therefore always up-to-date and ready for action. There are a vast range of different side hustle options. These could include writing a Kindle ebook, starting a blog or creating a piece of software to name just a few. They key is to decide on one side hustle that really appeals to you – and that you’ll enjoy working on each and every day. Don’t be tempted by “entrepreneurial ADHD”, jumping from one possible side hustle to another; instead commit to just one and work at it until it is successful. The other factor that I consider is my professional development. That involves taking online courses, reading about new subjects, taking certifications and so on. With just 20 minutes or so of study per day I’m able to put several hours into my development each week – all with a minimal time investment. The reality is that over time this really starts to build up. All that new knowledge, all that training and those new LinkedIn contacts – they can all lead to exciting new career prospects and pay raises. Let me be honest with you and say that many of my friends think I’m mad. The idea of unnecessarily getting up early sounds like insanity to them. That is until they start asking how I manage to find the time to grow all these little side businesses of mine. Its sad to say but if you want to increase your income with a side hustle then you’re simply going to have to make some tough decisions. Yes, building a side hustle takes compromise – but its so worthwhile. The key here is to take the actions that your future self will thank you for. Whether you plan to get up an hour earlier, or block off some time in the evening, the reality is that the sooner you get started the sooner you’ll start seeing those results. And as we’ve discussed, its those results which help to turn the initial struggle into a painless daily habit. So invest just an hour a day in building a stronger financial future. Commit to doing something that you’ll be proud of this time next year. Go hustle!